What do you look for in a house? Walk-in closets? A fireplace? A yard for your future children to run around in and for you and your partner to fight over who has to mow it? Free overpriced brunch items? If you fall into the last category, we have some good news for you. A real estate agency is luring potential home buyers with the promise of free avocado toasts for one year with the purchase of a house. The firm Ray White Sherwood is advertising townhouses located in the chic suburb of Sherwood, outside of Brisbane. The two and three bedroom homes are “perfectly suited to the modern lifestyle” (avocado-friendly) and are “designed to make fast-paced look effortless” (what). In addition to superb natural light and “views capturing the breezes” (huh?) busy young professionals will get a break on what is certainly any Millennial’s single largest expenditure: a weekly avocado toast. The cost of free ‘grammable breakfasts? Only about $439,000 U.S. dollars! Given that you could be saving around $800 on avocado-smeared bread, this seems like a steal. I know what you’re thinking — what kind of avocado toast are we talking here? What healthy-yet-delicious brunch staple is worth almost half a million dollars plus, potentially, the financial and emotional costs of breaking up with your significant other, quitting your job, saying goodbye to your friends and family, and relocating to the east coast of Australia in order to take advantage of this deal? Well, Ray White Sherwood has you covered. They’ve included a picture of a pretty decent-looking avocado toast in their listing. 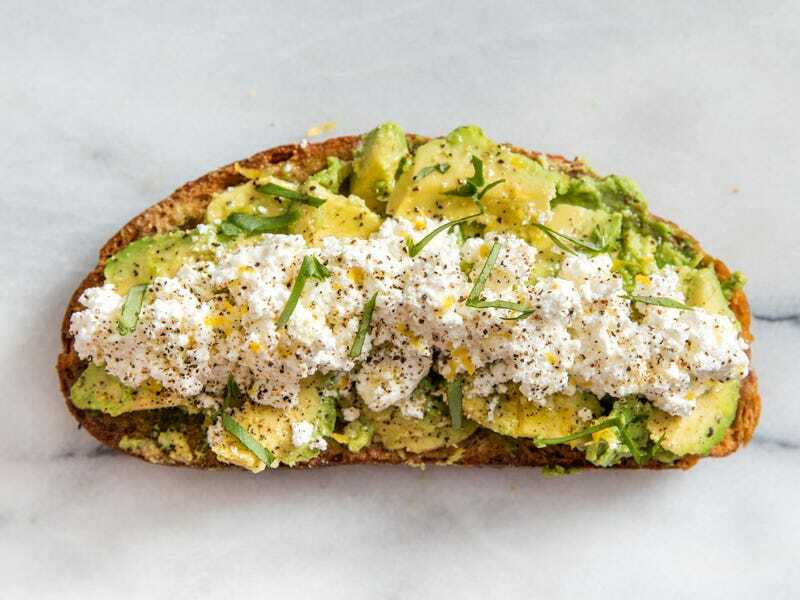 While we can all agree the inclusion of feta and herbs definitely pushes it over the $200,000 range, it’s admittedly a little disappointing that a $439,000 toast doesn’t include a poached egg or at least some pepper flakes. As absurd (or genius!) as it may seem to those of us in the United States, it turns out there is something of a cultural link between avocado toast and real estate in Australia. The connection was made initially by Bernard Salt, a columnist for The Australian who, in an article titled “Moralisers, we need you!” in which, among other things, he complains about millennials and how small the font is on brunch menus, he also asks why young people today spend their money on fancy avocado toasts instead of saving for a home. The BBC later calculated that, despite Salt’s well thought out claims (he also complains about the confusing signage on restaurant bathrooms) a special snowflake would in fact have to sacrifice 3,800 avocado toasts to save enough for a two-bedroom home in the Sydney area. Fortunately for millennials looking to buy one of Ray White Sherwood’s townhouses, 52 of those toasts are already taken care of.